The original plan conceived with together with Professor Eran Friedler and Ilan Katz, CEO of Water Arc, was to construct 2 technologies from either end of the technological spectrum– an extensive technology (Passive Aerated Biological Filter-PABF) to an intensive technology (Membrane Bio Reactor –MBR). The objective was not to promote any particular technology but rather to prove that if the two technological extremes could be authorized to operate, the authorization of a variety of other technologies (“in between”) would follow. Lessons learned from the pilot would provide experience and insight for the industry and related authorities. For lack of funding, only one technology designed by Professor Eran Friedler and Ilan Katz in the context of the “Round Table” was implemented– the Passive Aerated Biological Filter (PABF). Following meeting extensive administrative and resource development challenges, the technology was constructed in late 2013 and operated for approximately a year and a half. The treated water was tested for water quality levels while the remaining water was flushed into the sewer and in fall 2014, the system was granted approval in principle to operate by the Ministry of Health . Once the technology proved that it met water quality standards, there was no need to continue to operate the system as the objective of the pilot had been achieved. The system was shut down with the intention of reinstating the technology were the site to become operable. The PABF is an “extensive technology” with relatively low maintenance and operating expenses. While there is no formal IP, the technology affords “newness”. The Ministry of Health’s concern that the technology be safely integrated in a city environs, led to the modification of the proposed “constructed wetland” equipped with plants and requiring sunlight, to the development of a closed system which could be placed safely in an interior space such as the basement or adjacent to a building. A tarpaulin attached to the frame around the system was an additional feature requested by the Ministry of Health, , to minimize exposure to aerosols. The PABF tank is composed of layers of “aggregate / gravel .The greywater received from the showers of the mikveh, is pumped into the tank and swirls around the aggregate, creating a biomass which encircles the gravel and breaks down the sludge. (To expedite the process of biomass formation, when first operated, bacteria is added to the tank). 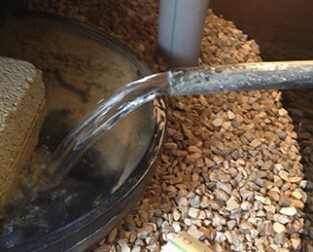 The water which permeates the aggregates is pumped back into the tank several times before being sent on for further disinfection by way of a sand filter. 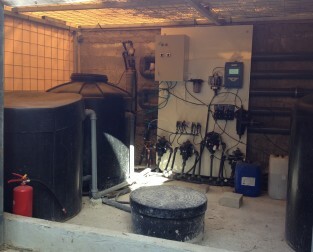 The water is then chlorinated, as required by the Ministry of Health, and ready for reuse. 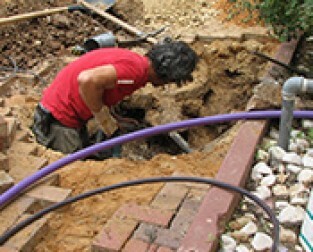 In recent years, the Ministry of Health has incorporated requirements for monitoring greywater systems online and the capacity to shut the system down (temporarily), if any malfunctioning of the system were to be identified. When Shomera’s system was designed in 2008-2010, these requirements did not exist were the technology to be reinstated, in order to receive Ministry of Health authorization to operate, any new requirements by the Ministry of Health would need to be incorporated .